Shine bright without a diamond, Amsterdam Watch Company is bringing you a Special edition of a dive legend; the ‘Squale 1521’. Squale and Amsterdam Watch Company together created a watch based on and with the heritage of a military ‘icon’. I am quite sure if you’re a ‘vintage watch head’ you will love this watch, and leave your 60’s sub on your nightstand. After all, if you are planning a trip below the surface a Squale will do the trick. Squale was founded in 1946 by C. Von Büren S.A. Montres Neuchâtel. The brand name Squale stands for Swiss Made professional diving watches. The great Swiss tradition of precision watchmaking, combined with a love for the sea and diving, were the two factors that led C. Von Büren to work exclusively on the construction of professional dive watches back in the early ’50s. In 1946 Squale began producing watches and watchcases for various small and big Swiss watch brands that did not have the knowledge to build professional dive watches. 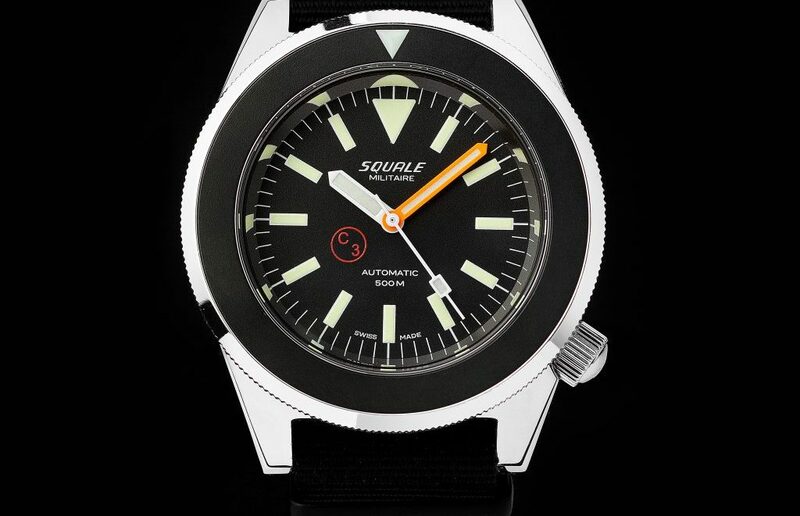 Smaller brands often left the Squale logo on the dial as a quality symbol. The big brands – big and cocky as they can be – often used their own logo. Due to the success of other watch firms that used the Squale watch cases, “von Büren S.A. Montres” started to produce watches under the brand Squale back in 1950. As most of us already know, this was the start of a brand famous for its high-quality diving watches. The first successes in sport, such as the world diving title won in Cuba in ’68, were linked to the names of products that had become as legendary as the medium, Master 50 atm. The ’70s saw the birth of the first “1000 metre” watch with glass on flexible mounting and snap-on lunette which could be turned in both directions. Squale continued to produce for other brands such as Blancpain and started to supply the elite corps of a large number of armed forces, including the parachutists of Italy’s Folgore Brigade and the Italian Navy’s Diving Corps. The cases Squale delivered to blancpain where designed for the ‘3H- bund’ made for the ‘West German Bundeswehr Kampfschwimmers’. All this has made Squale synonymous for quality and the benchmark brand for divers’ watches internationally, a status it has enjoyed for several decades. Amsterdam Watch Company brings a Special Edition of the Squale 1521. The Military by AWco. As the only official representative of Squale professional Diving Watches in the Netherlands has been jointly developed a numbered limited model of this great – and I can securely say – iconic diving watch. As you may expect from a company who handles great watches on a daily basis, AWCo gets their inspiration for the design of the Squale Military 1521 from a vintage ‘legend’ diver. The Blancpain ‘3H-Bund’, this watch was specificly made for the divers of the ‘Bundeswehr’. Vintage diving watches designed for military purposes are popular amongst enthusiasts. So why not release their own Military Special Edition? The dial is specially made for AWco and displays the word ‘Military’. The chosen material is luminous Super LumiNova with code “C3” which stands for light yellow and a 100% light intensity. The bezel is not provided with a minute mark, just like the original Bundeswehr watches. The 40 pieces are sold with a special package, coming with a Patch and a Cap. The back cover gets an engraving of ‘Special Edition’ together with the number asigned for that specific limited edition. Since 1956, millions of men and thousands of women have contributed to the Bundeswehr for the preservation of peace. The Bundeswehr has been through a lot during the Cold War, the unification of East and West Germany and has turned into a modern, deployable force; active in mostly foreign missions. In 1975, the ‘West German Bundeswehr Kampfschwimmers’ were equipped with a new diving watch, the Blancpain Fifty Fathoms’ 3H’, and they kept on using this watch until the early 80’s. Squale has made the watch cases for Blancpain, which in turn was commissioned by the the Bundeswehr. This specific Blancpain model was not available to the public, but only on military contract. Unlike sports divers, German divers used the “Closed-circuit rebreather Systems (CCR). These systems measure the depth of immersion in hours, whereby decompression was not necessary. In this case, the number of ‘triangle’ is sufficient. The usual minute format was not used and therefore not loaded. The high polished stainless steel case of the Blancpain has a bandwidth of 20 mm and the crown at the 4 o’clock position, important for comfort during use. The dial has a ‘3 H’ symbol on it, which indicates the use of tritium. Reading time off a wrist watch in low or no light is tricky. This problem has been recognized since the early days of wristwatches and the technique has developed strongly ever since. A variety of materials and chemicals has been used over the years for so-called “luminescence”, or luminosity, indicating wristwatches. Over the years, the unhealthy aspect of radioactive Radium became known and eventually the applied amount was reduced to 1 / 100th. In 1968 the use of Radium was banned and there were alternatives necessary. From that moment on tritium was the chosen material. Tritium was activated in the same way as Rh, combined with zinc sulfide. The big difference between radium and tritium is the amount of radiation that it emits and the ‘half-life’. The half-value time of radium is 1600+ year and 12 years of tritium. That means that many watches from the sixties rarely still visible ‘lume’ feature. In addition, the color changes as the material becomes older. Despite tritium is less radioactive, there were health issues leading to regulation and requirements. The use of radioactive material has been defined by the ISO 3157 standard which allows only two radioactive: tritium (3H), promethium (147 Pm). The dials of military watches that used tritium, were often marked with a circled T. In the search for alternative ways to produce ‘luminosity’, it came to materials that do not give out themselves slightly, but materials that require an external source that gives light: Photoluminescent. In the late 90’s LumiNova was developed by the Japanese company Nemoto & Co. Ltd. LumiNova and Super-LumiNova are photoluminescent: they glow after contact with a light source and weaken slowly. It is important to know what it is used for light fabric for the user of a military watch. It is, therefor, a specification of many governments, military units and that this visible on the dial by means of a clearly readable symbol. A well-known example is the Heuer “Bund” chronograph. Here is 3H in a red circle printed on the dial. The symbol of tritium. 3H denotes a light green color and a 100% degree of intensity of the light dust. Unfortunately, it has been found that the shelf life of this tritium is not eternal and often decreasing the color intensity, and can even become discolored to dark brown. Something appreciated by lovers of vintage watches, but not useful for the purpose for which it was conceived. Especially for professional and military divers, life of readability is important. Besides the use of dive computers, it is rare to find a diver who does not wear a watch on his wrist. It is, therefore, quite an improvement that LumiNova is professionally used in watches. A great aplause for Squale and AWCo for creating such a good looking watch, it is totally a todays watch but breathes history. Besides that, the great price of (only) € 1195,- can be called ‘peanuts’ for such heritage around your wrist. With no doubt this is a sharp price for an ‘icon’.